We met on 1 March, 2014. 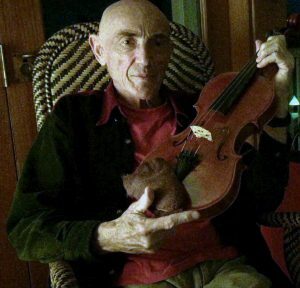 When I slipped into the seat next to him at a writing seminar, I had no idea he was a skilled architect, or that he danced the tango, or that his playing of the haunting doina lament was beautiful enough to make you weep. I could have sworn he was in his late fifties; early sixties at the most. I had no idea he was approaching eighty. I had no idea that his charismatic personality would spark an idea that would grow into a character in my next novel, as yet unwritten. Or that three years later I would be sipping lattes with his ex-wife and discussing his remarkable life. I had no idea that he would choose to end his life because the grey wolf was growling at his ear and snapping at his toes, and he was tired of running. Ours was a chance encounter. ‘I’m here because I’m thinking of writing my memoir,’ he said. 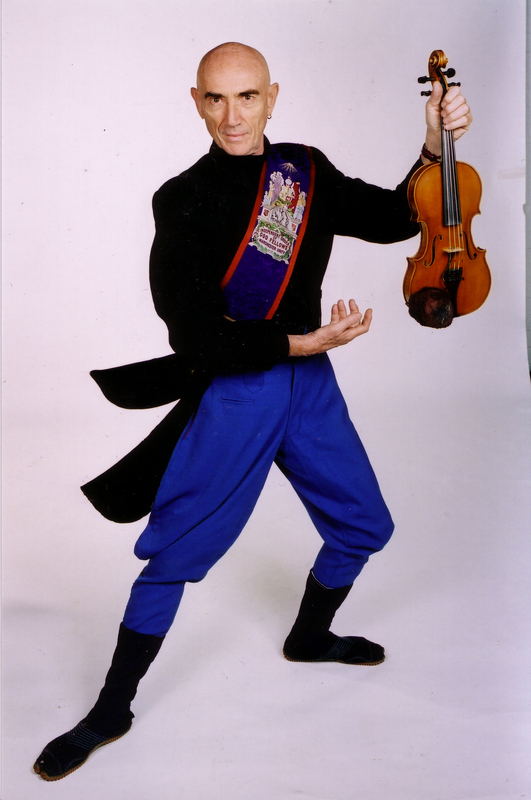 ‘About music and violin, and architecture and tango.’ He wore the colourful clothing of a younger man, a bohemian. His head was bald. ‘Call me Moshlo,’ he said. And I wondered if that was his first name or his last. I replied, but my last few emails went unanswered. I received a reply from a stranger. ‘This is Carla, Moshlo’s ex-wife, writing. I have the sad news for you that Mosh committed suicide last April – just over a year ago. He was plagued all his adult life by depression, anxiety, mild bi-polar…so many diagnoses that in the end just meant he was fiercely talented, passionate and embraced both the dark and the light. He stopped taking his medication and the dark took him. I was shocked, and saddened. I felt an extraordinary and unexpected grief for someone I hardly knew. 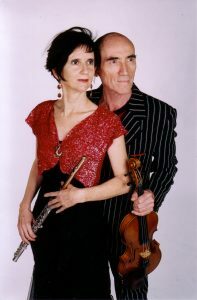 Carla and Moshlo were together for over twenty years, partners in music, dancing, film; in love and in life. Over the next eighteen months, as his estate was finalised and those he cared about were coming to terms with his loss, Carla and I kept in touch as I unravelled the astonishing story of Moshlo’s life, and of his death. His was a legacy of childhood pain pinned to a framework of intergenerational trauma. He once said that he sacrificed his life for art. Music was an expression of his grief. Morrice Shaw was born in Poland in 1935. He was circumcised by his grandfather, a Rabbi of some standing, who later disappeared during the conflict. His family immigrated to Australia two years later (before the war, although the menacing grip of anti-Semitism had already taken hold in Europe). His parents, poor but hardworking Jewish migrants, settled in Melbourne in the working-class suburb of Elwood. His father was a furrier who began by adding fur trims to coats, and ended his career in the rag trade as owner, with his brother, of The Shaw Brothers, providing haute couture fashion to Australia’s elite. He dressed the Prime Minister’s wife. The family moved to the upmarket suburb of Toorak. At the age of five, Moshlo began training as a classical concert violinist. His teacher, intense and exacting, (Moshlo described him as ‘a small, sinister man with a club foot’), tortured Mosh with a demanding, emotionally abusive and punishing regime of practice and performance; Moshlo spoke of ‘working with blood-sweat’. 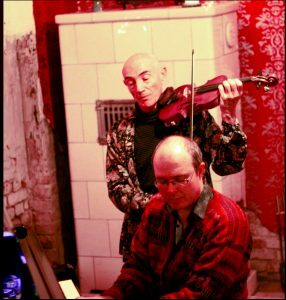 As a teenager, Mosh would sometimes visit his neighbour’s home, the family of the renowned pianist David Helfgott, where David’s father would accompany him on piano. Moshlo and David shared similarly intense and gruelling musical training. And so, for him, the dichotomy of music was created: at once passionate and enlivening, a zealous fervour, an obsession that would consume his life. But also, in contrast, a tortuous aspiration that could never be achieved, an idea of perfection that could never be reached. Throughout his eighty years, this intensity of music was both angel and demon, both lover and betrayer, as necessary as breathing and as turbulent as chaos. Moshlo, by that stage in his forties, had designed three internationally recognised houses. One day, while collaborating on a building site together on Scotland Island in Sydney, Moshlo was working four stories up installing huge panes of glass when he slipped and fell, head first. The much younger and stronger architect, secure on scaffolding one floor below, managed to catch him by the ankles and his belt buckle on the way down. The friendship of the two men was firmly bonded by this act of fate. ‘My first husband saved the life of my second husband!’ Carla quips. Moshlo would travel from Brisbane to Balmain in Sydney to stay with the couple, and he and Carla sporadically played music together. While he enjoyed architecture, music was always his first passion. They lost contact for about five years. Carla was leading a glamorous life with the Australian Opera, ‘dressing up each night and going to after-parties,’ but after eleven years together she and the architect had divorced and she was single and looking for a new relationship. Moshlo re-entered her life in the most glamorous way. ‘He suddenly burst into my life again. He left me a long message on my answering machine. In French,’ she says. ‘I don’t speak a word of French! I had no idea who it was from.’ Mosh had heard from a mutual friend that Carla was divorced and decided that finally, here was his chance. He later arrived at her house in electric blue jodhpurs and jika-tabi, traditional Japanese split-toe footwear, wearing white aviator sunglasses and a vest that showed off his sculpted muscles, and bearing a huge bunch of flowers. ‘He really wanted to make an impression,’ she says. ‘And it worked.’ Their courtship had begun, and he romanced her in style. ‘He was utterly full on,’ she says, ‘utterly. ‘It was a whirlwind, as narcissists often are. Overwhelming. 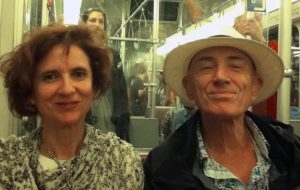 He flew back to Brisbane, packed up his car and moved in with me.’ Everything happened very quickly and by the end of 1995 the pair was living together in Sydney and performing duets – making music – again. ‘Mosh wanted me as a way back into the music world,’ says Carla. Despite a twenty-year age difference, the couple’s remarkable professional association and romantic liaison blossomed. I ask about children. ‘No,’ she says, ‘although I would’ve liked to have children with him, and I do regret that, but rather wisely we didn’t. He knew he would have been a shocking father. He was much too self-occupied to be able to deal with kids.’ I comment that it is unusual for a narcissist to have the presence of mind to recognise this in himself; Carla explains that his experience with his own – often absent – father affected him greatly. Frequently Moshlo suffered what he called a ‘crash’; what Carla now recognises were nervous breakdowns or severe anxiety attacks. The first time this happened, not long after they began living together, she arrived home from work at the opera to an empty house. ‘[He was] completely gone. No note, nothing.’ She didn’t hear from him for months, and she had no way to contact him, until he sent a postcard, then eventually returned. I ask her what drove him more, the women or the music? ‘That’s a very good question,’ she muses. ‘He was a classic narcissist. He would triangulate,’ she says, ‘he always had a third person in the background, [someone he would] use to get what he wanted out of his primary relationship.’ He triangulated with Carla, telling her she wasn’t as good as his previous partner and she should lift her game, and Carla knows from subsequent discussions with her and other women that this was his modus operandi. He latched on to women and befriended them to help him recover. He loved tango and music because women were attracted to the culture, and therefore to him. ‘He wouldn’t have affairs with them, necessarily, but he would become close to them, zero in on them, talk really deeply …’ She stares intently at me until we both laugh. ‘And I’d watch it and I’d sort of laugh, because it was … really convincing.’ She sips her coffee. I comment that it seems he never really separated from anyone, and she agrees. ‘He would move on, but use that woman to triangulate with the next one.’ The women would each feel tortured by the other women in his life. I suggest that while obviously this was not fair on the women, it also says something about Moshlo, about how he felt about creating bonds with people, and what he felt about breaking those bonds. We talk about this aspect of his personality perhaps being a result not only of his own trauma as a child, but of the intergenerational trauma of his people, and of his family. Moshlo often described the generational anguish of his older family members. Moshlo’s parents returned to Poland only once, in the sixties. When they visited the village of his birth, the townspeople apparently looked at them and said ‘What are you doing here? We thought we’d killed you all.’ Most of them had indeed been imprisoned at Auschwitz, or in other concentration camps, or had remained in hiding during the war, but incredibly had endured. ‘They were survivors, that family,’ says Carla. Indeed, she often speaks of the condition known as Children of Survivors’ Syndrome as pivotal to understanding Moshlo’s mental health. This constant background hum of distressing family dynamics, religious persecution and traumatic historical experiences tortured Moshlo. ‘He was empty,’ says Carla simply. ‘He was constantly empty.’ His father was often absent as he worked long hours, and although Carla only knew Moshlo’s mother in her later years, when she was ‘very sweet to me’, his other friends described her as terrifying in her prime. ‘She adored her kids, but they could never, ever impress her.’ Carla recalls Moshlo showing his mother an article in a high-end boutique magazine, featuring one of his architectural designs. ‘“What”, she said to him, “only four pages?”’ She laughs again at the absurdity of the caricature; Carla laughs easily, and finds amusement in what were surely painful times. ‘It was irrational, but he was always looking for approval.’ As an adult, Moshlo became estranged from most of his extended family. He considered them damaged by their tragic past; he found them unpleasant, judgemental and coarse, almost without exception. ‘It’s harder,’ I say, deadpan. ‘Oh, neither do I,’ I say. ‘Nothing to tell here.’ We explode in inexplicable giggles. Underneath her natural and easy manner, Carla shows a hint of subtle strength, self-possession and equanimity that clearly helped retain her sanity during a troubled and chaotic relationship. We talk for a bit about the flipside of being close to a narcissist – the many positive and upbeat facets of Moshlo’s personality that Carla adored. Although those close to him, including Carla, could see he was not well, they continued to make excuses for his behaviour, because to live with Mosh was to experience all of the highs, as well as the lows. ‘My theme song was that children’s rhyme,’ says Carla. ‘When he was good, he was very, very good, but when he was bad, he was horrid.’ He masked his insecurity with cruelty, and opinionated exaggeration. ‘The good times were so good, because he was so charismatic, and we had so much in common. We danced tango really well together. We played music really well together.’ But music and dancing weren’t enough. The highs and lows continued, like a see-saw. One of the highs for the couple was learning Latin dancing together, eventually reaching semi-professional level. After Byron Bay, they moved to Paddington, in Brisbane’s inner west, while Carla completed her Masters. Their home was known as the ‘yellow tango house’. 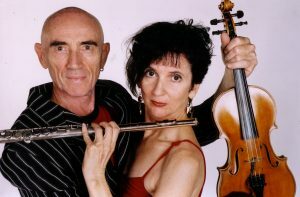 Moshlo and Carla embraced the joyous melancholy of tango, the sensual rhythm, the ancient beat. 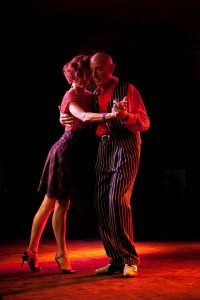 Tango became a passionate and important part of their lives, and they passed on this joy by teaching others. ‘Mosh was an amazing dancer. The tango heightened his attraction to women, and he fed off that connection.’ The pair established the tango band, Tango Paradiso, they recorded together and travelled extensively, particularly to Argentina, the home of tango, a city of fading decay yet joyous, intense embrace. His moods were much more stable during this period, as he was taking anti-depressants. ‘They were fantastic,’ she says. ‘When he took them. But of course, then he would feel much better and decide he didn’t need them anymore. And that became the battle.’ Mosh simply didn’t like the idea of medication, and would sometimes take merely ‘a crumb’, even though he knew the meds kept him steady. ‘Very difficult for you,’ I venture. Moshlo and Carla communicated every day, despite the presence of other women in his life. ‘I really knew him,’ she says simply. Romano interjects: You are too modest, he seems to say, touching his lips to hers. And what he does say is: ‘He was totally dependent on you.’ It seems true that Moshlo was still reliant on Carla to the very end of his life, despite their divorce. I move the conversation back to the doina, the musical form about which I was ignorant until I met Moshlo. The first time he heard doina, the mystical, trance-like music reignited a memory in Moshlo’s mind of the lullabies his mother sang to him as a child in Poland; the subconscious sounds of his past. The gravitas stirred him. It was his description of the haunting lament (the klezma, the ‘Romanian Blues’), and the video clips he sent me – dark, grainy, black and white montages of flickering candles and sinister shadows with the strains of evocative, melancholic music – that first sparked my imagination, and created the building blocks for the character in my novel. What of the doina? I asked. Moshlo and his piano accompanist, Paul Hankinson, a ‘brilliant musician’, practiced over and over in the war-ravaged concrete bunker. Mosh would perform ‘hundreds of takes until it was exactly as he wanted it to be’, then Paul would record an accompaniment separately. Fittingly, they practiced and recorded just across the road from the biggest flak tower of the war, from where the Germans shot down Allied planes, and also across from the dungeons where SS Nazi soldiers tortured countless Jews. 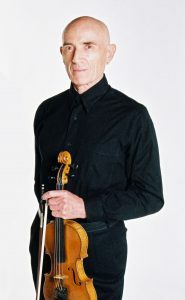 Yet despite this intense practice, the performance of doina is not precise like the playing of modern violin; the tones slide from one note to another, searching for the right resonance. Rather than playing a precisely notated musical score, the doina calls for improvising around the notes, which allows the performer to express their own individuality and feeling in the music. This is what gives the doina its unique sound. The doina provided a respite that resonated with a deep, generational familiarity. ‘I have tidal waves of despair, I can’t take this any longer, and I thought, the best thing to do now, is just to surrender, and to surrender my life, completely. And so I tried to kill myself. You know, in my life I think I feel that a grey wolf has been shadowing me. Suddenly it began to pick up speed, the wolf was panting and I could feel its breath, it was hot on my heels, I always felt that it wanted to consume me. By January, 2015, four months before his death, Moshlo’s depression and anxiety had become steadily worse. Although she was communicating with him every day, it was only later that Carla discovered that he had stopped taking his medication nine months earlier. He began to panic more frequently. He fell and fractured a vertebra. He felt frail. He no longer wanted to cope with the debilitating incursion of his illness, or with his intrusive black thoughts. He felt he was losing his edge, losing control, that his beauty was fading and his body was failing. He was mourning the loss of himself. He called and emailed her constantly, leaving long messages, and declarations of love. He was, he said, exhausted. ‘I had seen him go through this so many times, but he always came out,’ says Carla. This time was different. He went back on his medication, but ‘the wrong ones, and it took a few weeks to realise they weren’t working. He was very down.’ He sent Carla (in Sydney) an email telling her he loved her, that they had shared an amazing life together, but that ‘this is the final curtain and I can’t take it any longer.’ Carla called a Brisbane friend to check on him, to find that Mosh had sat for three hours in his car in his garage, with a bottle of champagne, breathing the car exhaust through a tube from the running engine. He was hospitalised, and Carla immediately flew back to Brisbane. She moved into his house to care for him, and was there when he was allowed home on weekends. It was, she says, ‘the worst I’d ever seen him. He’d lost a lot of weight, crashed. He couldn’t take in nutrients … nothing life-threatening but everything to him felt like it was going wrong.’ He had made a serious attempt at suicide, and was dismayed that he failed. Perhaps to himself he intoned his mantra that he would not be thwarted, but outwardly he assured his friends that he would not try again to take his life. It was during this time, and at Moshlo’s request, that Carla made a short film – a poignant, moving piece – The Last Portrait of Moshlo, in which he talks about his life and his pain; his extreme exhaustion; his grief and his depression; the grey wolf pursuing him, snapping at his heels; his desire to surrender to the wolf, to end his life. He trusted she would portray him authentically. This is her specialty now: portraiture in the digital age. Portraits not of traditional paint and canvas, but of film and sound. Short and affecting visual snapshots that reveal a person’s own view of themselves. For a short time, it seemed Moshlo had stabilised. He still spent much of his time in the hospital; he was taking his medication. Even his psychiatrist thought he was doing okay. But the perfect storm had arrived. He waited until Carla left for a brief visit to Sydney. During his weekend day release, a mutual friend was living with him and housekeeping in Carla’s absence. Usually they went to the markets together, but on this particular day he said he didn’t want to go. He was too tired, he said. He was determined not to be thwarted. The friend arrived home after shopping and assumed he was downstairs sleeping. When she went to wake him for lunch, she found a note at the top of the stairs, warning her not to go any further, and asking her to notify the police. His last attempt at shielding his friend failed, as the triple O operator instructed her to search the house. She found the worst possible scenario. Moshlo had tried to slit his wrists in the bath. When that had proved too slow, he had hung himself in the laundry. Perhaps he departed this world by dancing on to the next. And yet to so many he was a good man. To his ailing parents in their final years, to the women in his life, to his many friends, to musicians with whom he collaborated and composed and performed. Like so many of us, he was both joyful and dark, both light and shadow. 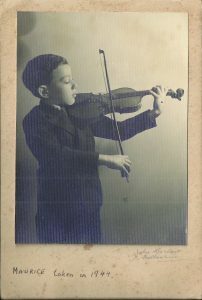 The morning he died, he left a note on his treasured violin, addressed to Carla and Romano, asking them to care for it and, when they felt ready, to donate it to the conservatorium in perpetuity, to be lent each year to a student who otherwise might never experience playing music on such a beautiful instrument. Light and shade. Moshlo bequeathed nearly his entire estate to the charity Medicines sans Frontiers, a legacy which appeared to disappoint his immediate family. Inexplicably, Carla bore the brunt of this disappointment during the two years after his death; a settling of the estate that was drawn out and distressing. Carla was unable to retrieve the personal mementos that meant so much to her: photographs, recordings, small tokens of the life they shared. In this way, his death somewhat mirrored the tortuous struggles of his life. At the end of our time together, Carla and I are both simultaneously exhausted with the telling, and invigorated with the reliving of those tumultuous years of suffering and desperation, of passionate joy and furious intensity. She says she is stronger now, that she has more emotional resilience. I am glad. She seems a very balanced person, with an energy and vitality that belie her years of life experience. The estate is finally settled, the house sold, the proceeds distributed to various charities and Moshlo’s loved ones. Their intertwined life created enormous joy and terrible sadness; that dichotomy again, of light and dark. I reflect on chance encounters, on how one story leads to another, on how our lives are linked by the infinitesimal minutiae of living, and the vast infinity of consequences. 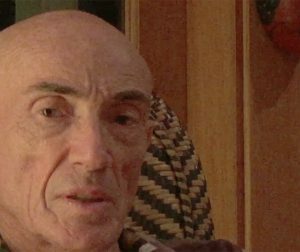 Last Portrait of Moshlo from carla thackrah on Vimeo.